Executive Flight Training at SafePilot is based in South Carolina. 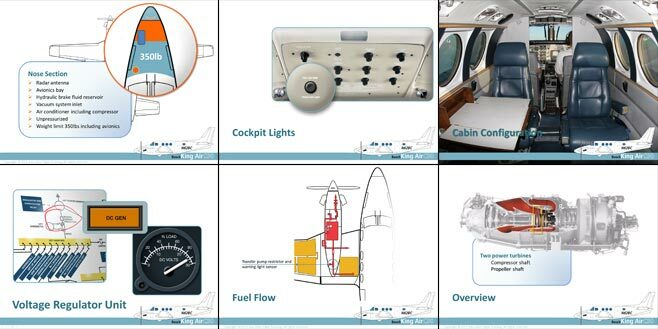 It specialises in training modules on specific types for commercial pilots. Doug Carmody contacted me initially to produce a module for the Beechcraft King Air C90, but we've gone on to put together material for several other types. Doug was looking for a good PowerPoint developer, ideally with some interest and understanding for aviation. He found both, but had to bridge the Atlantic to find them in one place. Fortunately that's not a barrier nowadays, thanks to Skype, e-mail and my tendency to work distinctly odd hours anyway. The modules are mainly PowerPoint-based, but I extended some of them using Articulate e-learning systems to give recordable quizzes.